Our initial plan was to leave early Sunday morning. We spent much of Saturday waiting. We aren’t good at waiting, and it finally dawned on us that we were allowed to leave whenever we wanted to. A flurry of activity, and we were out of the house and starting down the driveway by 4:15 pm. In keeping with our intention to drive the blue highways through New England, we took the “scenic route” to Truro, and then set Saint John in our sights as our destination for the evening. It was a pretty drive, gorgeous day with storybook fluffy clouds in a bright blue sky. As the sun went down, and we got a bit crankier, we drove into the outskirts of Saint John. Lots of construction, exits that were blocked, loads of traffic…. arrgh!! On top of it all we felt slightly poisoned by the bag of chips and kettle corn we were eating (and the weird fizzling Skittles we ate… kind of like soap, but oddly entertaining). Crankiness ensued. I guess it started going downhill when we couldn’t decide if we wanted to find a hotel in the downtown or on the west side (to ease our leave-taking the next day). By the time we realized that downtown was probably a good idea, we realized that the exits were blocked by construction and we were then pushed along through a toll that Mr. 761 resented mightily, and into a fairly unsavoury part of the city. Mr. 761 could wax on for days about ineffective signage etc., but I think it comes down to poor research (as in, well, none) on our part. If we’d done some advance planning, we wouldn’t have spent the night in the Country Inn and Suites (“sounds quite swanky, until you realize the country they had in mind was Belarus” said Mr. 761). It was, well, serviceable. One of the tv’s was a bit temperamental (had to warm up), the room had a slight odor, and there was no shampoo, but it was okay. For a late dinner we went to the non existent hotel restaurant Sobey’s down the road and bought a weird collection of food that struck our fancy. We then ate it in the room, with plastic knives and forks we cadged from friendly Steph, the night clerk (who was, oddly, still there at 10 am this morning when we left). Really, I kind of liked it. No pictures because in my haste to leave Berwick I left my SD card in my laptop, which I didn’t take (Mr. 761 brought his). Dang, I hate when I do that. Today we (okay, I) slept late till about 8:30. We considered eating the continental breakfast at the Country Inn but it was not appetizing, nor was there enough room for us to even be able to reach the mini-box of cereal on the shelf. I drank an apple juice and we left, waving at the large people in their nighties, smoking on their “patio” behind the hotel. Beautiful day, happy people. We’ve driven through Maine at a fair clip, but it didn’t feel rushed. We were going to stop in Bangor, but it looked closed today so we continued on to Lewiston/Auburn (sort of a twin city). Mr. 761 had an excellent Best Bitter and an even more excellent “Blueberry Courage” Beer from a little brew pub. Home-made shepherd’s pie and flaky and wonderful fish and chips filled us up. to stop in daylight today, and chose Meredith NH. I’m very glad we did — it’s a gorgeous little place. 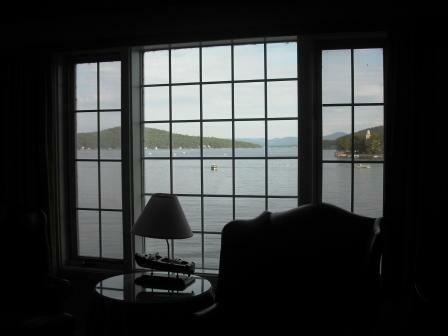 The hotel we chose, really the first we saw, is called The Inn at Bay Point – one of 4 in a loose complex around Lake Winnipesaukee — a lake which is not only beautiful, but fun to say. The Inn has what we’ve decided is “upscale tourist kitsch”, which is perfect. downstairs, but may instead choose room service. 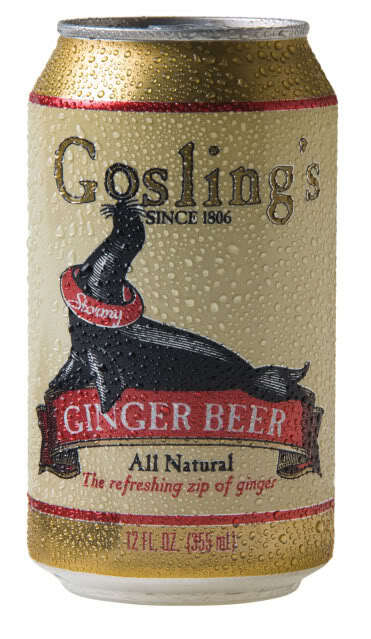 Mr. 761 went out and got himself some beer for the room and brought me back the best ginger beer I’ve ever had: Gosling’s Stormy Ginger Beer. We haven’t stopped for any antiques or yard sales (saw only a few, the whole way here). Well, we tried to stop at an antique store in Maine, but he took down the Open sign as we drove into the parking lot. Sigh. I’m sure we’ll see more tomorrow. Am very happy for text messaging today — daughter sent a picture of a dress she got to go to a dance, and it was so nice to be able to see it. It made me a bit sad that I hadn’t been there to help, but even if I were at home at Box 761 I wouldn’t have been able to…. she’s away at work all summer. It didn’t bother me until today, when she sent me that picture, and I wonder now if the fully empty nest next year will be as great as I thought. Something to come to grips with this year, I guess. I miss you, kid. Have a good time at the dance! Tomorrow’s route is more blue highways, from here to Rochester NY.